Oyster Piracy: The History of Taking What Isn't Yours; or, "How to Be Shellfish"
Piracy is an act of robbery or criminal violence by ship or boat-borne attackers upon another ship or a coastal area, typically with the goal of stealing cargo and other valuable items or properties. Oysters have been long regarded as a unique and sought-after food, from the time of Cleopatra, the oyster stalls of post WWII New York City, and even along to current dollar oyster nights at bars and restaurants all over the country. When items are coveted, they are often gathered and hoarded, and people will do whatever they can to get their hands on some. In the early 1800s, there were booming oyster fisheries on both sides of the coast and were most dominant on the Chesapeake Bay in Maryland and the San Francisco Bay area. In Maryland, harvesting on the Chesapeake was a challenge, as common practice was to rake, dredge, or tong for oysters while balancing on rickety boats during high tide. The lucrative work was worth the effort, as oysters became a status food with the steady income most had post-Civil War. Hundreds of oyster vessels occupied both he Maryland and Virginia areas of the bay, creating stiff competition between watermen, especially between those who tonged and those who dredged. The harvesters who used tongs would go out in shallower waters, carefully culling and packing the best of the bounty. The dredgers were a bit more resourceful, going out in larger boats at deeper depths, dragging over the beds. Animosity rose as the dredgers could make four times as much as the tongers, and the dredgers often destroyed beds in the process of harvesting such a large amount. Some clashes even ended in gunfire. 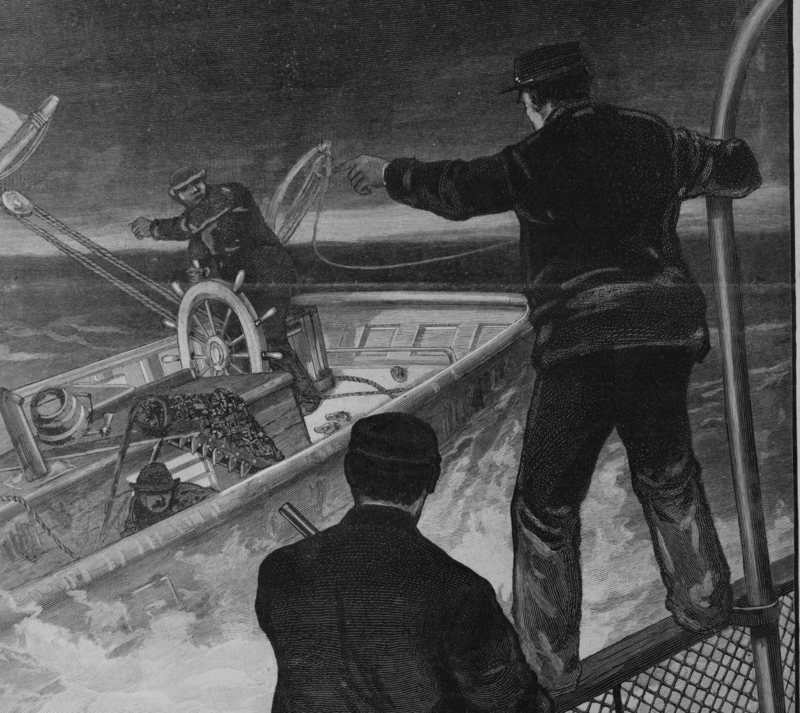 The dichotomy of industry called for protection in the form of the Oyster Navy in 1868, which was met with extreme reactions from attempted murder of the fleet’s captain and actions to sink the policing boats. Fast forward few years to 1890s and travel to the opposite coast, where the San Francisco scene was booming. Fleets of boats monitored their beds by day, but under the cloak of night, a band of scallywags greedily raided their supply. On a good haul, the scavengers could bring in about $200 worth of oysters for three or four days’ worth of work, calculating to about $25 a day for the two men harvesting and culling on the boat, but that was the easy part. The hard part was keeping themselves hidden from the patrolling entities and the men who owned the beds. Jack London (who wrote Call of the Wild) was among these poachers and even wrote stories about their efforts in a group of short stories called Tales of the Fish Patrol with a section dedicated to taking down the offenders called A Raid on the Oyster Pirates. While aquaculture has grown and become more regulated, there are still a few acts of wanton thievery in our midst. In 2016 poachers were caught and charged with felony level theft in Maryland. Around that same time, beds in Wellfleet were ransacked at night, depleting their stocks for their current and future sales. While they aren't pirates, these thieves are still a mark of greed amidst a continuously booming industry, even with the advances in licensing and regulatory patrolling.